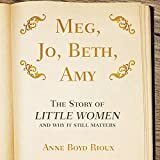 Meg, Jo, Beth, Amy [sound recording] : the story of Little Women and why it still matters / Anne Boyd Rioux. By: Rioux, Anne Boyd [author.]. Material type: SoundPublisher: [Minneapolis, MN] : HighBridge Audio, Edition: Unabridged.Description: 8 audio discs (9 hr., 30 min.) : CD audio, digital ; 4 3/4 in.Content type: spoken word Media type: audio Carrier type: audio discISBN: 9781684413201 :; 1684413206 :.Subject(s): Alcott, Louisa May, 1832-1888. Little women | Girls in literature | Girls -- Books and reading -- HistoryGenre/Form: Audiobooks.DDC classification: 813/.4 Read by Kimberly Farr.Summary: As the beloved classic celebrates its 150th anniversary, discover the story of the novel that captured the imaginations of generations of girls. As the beloved classic celebrates its 150th anniversary, discover the story of the novel that captured the imaginations of generations of girls.